RIMOWA continues to mark its 120th anniversary by staying squarely focused on the future. Today, the modern luxury travel brand is pleased to announce the much-anticipated collaboration with Italian streetwear label OFF-WHITE and the release of a one-of-a-kind product. Founded in Milan in 2013, OFF-WHITE is the brainchild of American fashion designer, DJ and Louis Vuitton's menswear artistic director, Virgil Abloh. In their first collaboration together, the two brands have created a distinctively original transparent polycarbonate carry-on case. Its accented black handles, wheels and labelling on the locks and telescopic handle are characteristically and unmistakably OFF-WHITE in the way it adopts branding detailing into its visual language. A brazen, yet playful response to today’s obsessive talk of privacy culture of surveillance and anonymity, the transparent design keenly hones in on the now and the next. A brand all about creating the covetable from the mundane, OFF-WHITE has banked on irony. And while this case’s size is based on the RIMOWA Essential model, due to its transparent design the RIMOWA X OFF-WHITE case has no interior lining and instead includes the Flex-Divider system in black and customized bags for more efficient – and modest – packing. 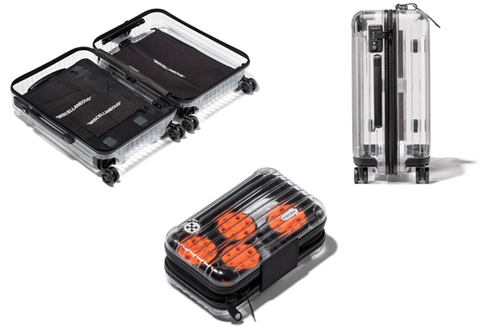 Each transparent hard case is fitted with RIMOWA‘s silent Multiwheel system for optimum manoeuvrability, TSA combination locks, and an exclusive transparent amenity kit with an additional set of wheels in OFF-WHITE orange that further emphasizes the overarching concept of the special edition case. The suitcase will be premiered on June 20th during OFF-WHITE’s men fashion show in Paris. Select friends of the brands will be gifted personalized black aluminium cases emblazoned with the OFF-WHITE style label “Personal Belongings”. Patrons will have the opportunity to purchase a RIMOWA x OFF-WHITE case of their own from June 25th in select RIMOWA & Off-White Stores, on rimowa.com (Europe), at select wholesale partners, and in a pop-up store on wechat. Firmly rooted in the current, OFF-WHITE sardonically threatens the stubborn boarders between the worlds of streetwear and high fashion. The brand excels at infusing their collections with timely inspirations ranging from the graphic lines of a Mies van der Rohe to typography and contemporary prints. It provides a ready-to-wear wardrobe that reflects luxury as it is lived today. Now, together with RIMOWA, they’re on to rethinking design in travel.